I was going to be here in Fallon for a day, and it was just as well that I was too tired to do much - there doesn’t seem to be much going on here. I did make it to the county library in the afternoon and got a half-hour slot for internet access. I had been spending the morning trying to get online with my PDA from my motel room so that I could upload this journal. I couldn’t figure out, however, how to get the PDA software to work with a telephone credit card and the motel telephone. So I spent some of that half hour looking for a way to do it and got some information from the Palm website. I then checked my e-mail. Halfway through, Jacob walked in. He had spent the night I spent in Carson City in a park, also in Carson City, then the next day had got lost and returned to the park. It was now mid-afternoon, and he expected to make it several miles beyond Fallon today. I expect to be leaving Fallon very early tomorrow morning, so we agreed to try to meet at an intersection about 25 miles east of Fallon around nine. When I got back to my motel room, I went diligently about connecting to the web again, this time with useful information about using the telephone credit card. And it worked - once. After that, the modem handshake process never seemed to reach its usual successful conclusion, so eventually I gave up. I don’t think it’s the modem, as it worked once, and worked just fine back home. It could be Covad, my ISP, or it could be the quality of the line from me to Covad. I’ll try again farther along the road. Between Fallon and Austin, there is no place to eat or stay except for Middlegate, which has a very primitive motel and a cafe. I didn’t want to stay in the motel, and of course I’m not camping in Nevada, so there was no choice but to do the full distance to Austin, 112 miles. The first 49 miles, to Middlegate, was easy. The first several miles was farmland; doubtless more melon and alfalfa. 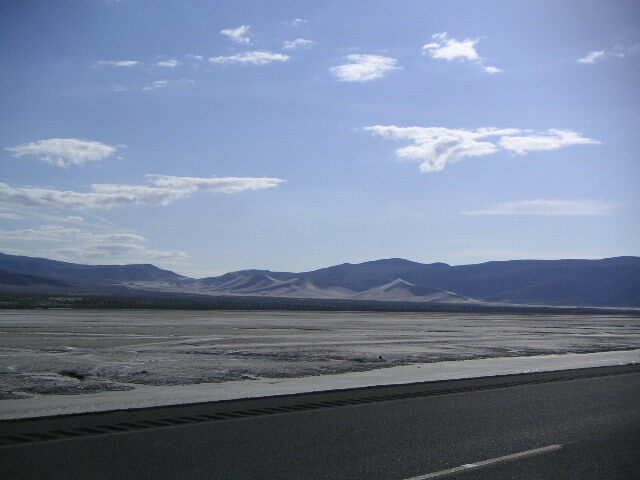 Beyond that was the Fallon Naval Air Station, where the land suddenly became completely barren and turned into an alkali dry lake bed. Just a little past the entrance to the Air Station was the first Nevada brothel I’d seen so far. It was just a collection of ratty looking trailers with a chain link fence around them. As I approached Sand Mountain State Recreational Area (much, much less grand than it sounds), about 20 miles from Fallon, I saw Jacob pull out of the access road. He had spent the night there. So we rode together over some not very demanding terrain to Middlegate, where we stopped at the cafe. The sandwich I got was in fact very good. This was the middle of nowhere, a flyspeck on the map fifty miles from anything, and I expected some really bad food. But in that I was disappointed. After Middlegate there was some very pretty countryside, nothing but scrub, of course, but in a beautiful collection of shades of sage green. 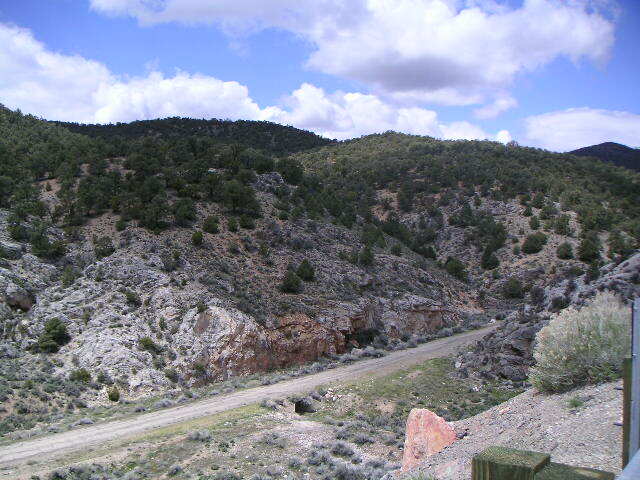 Eventually, though, we hit the first big climb on US 50, New Pass, at 6565 feet. This was a climb of a couple of thousand feet from Fallon, and the pass itself was a slog, but not an impossible one. It wasn’t until just before Austin that the riding got hard. The town is partway up a mountain, and was visible from something like ten miles away, the first part of which was descent or flat. But then the climb began. 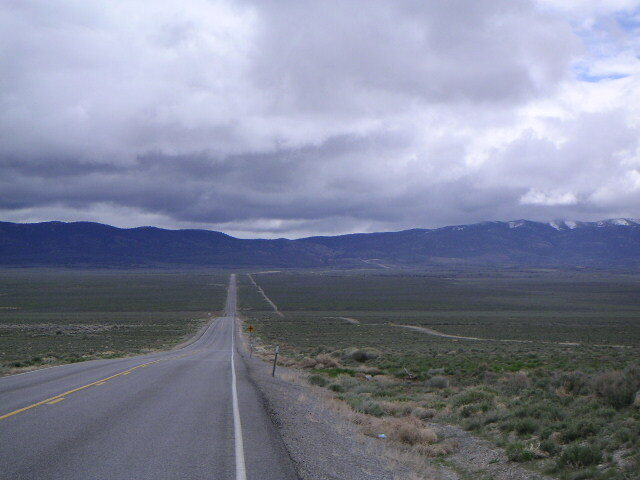 The start of the climb was typical of this road in Nevada. The areas of plain are large, tens of miles across at least, and seem to be bowl-shaped, so that it is impossible to tell from looking around whether the road is inclined up or inclined down. You can only tell by how fast you’re going. And here, although the terrain looked very flat, we were going slower and slower, so we were clearly climbing. Then a couple miles before the town the road started a couple of very wide switchbacks which were very steep. I’d gone 110 miles by now, and I had very little energy left. So it was a painful struggle to get up into Austin, where I saw three motels, each more run-down that the last. I checked into the least objectionable, went across the street for some dinner at one of the two cafes in town, then fell into bed. I was asleep a little after eight. We were on the road around 8:40. I had run across the street to the same cafe I’d had dinner in for some breakfast, and come back and packed and checked out of the worst motel I’ve been in in a long time. But it was probably the best in Austin. The road out of Austin continued to climb steeply to Austin Summit at 7484 feet. Jacob stopped to rest just before the top, but I went on down the other side, then up to Bob Scott’s Summit (7267 feet) and down the other side of that. Jacob was nowhere to be seen. So I continued on, and in another dozen miles or so crossed Hickson Summit (6594 feet), the last major climb of the day. That is, the last major climb marked on the map. I had not bought any fresh food in Austin, and there was nothing between Austin and Eureka, so my calorie intake for the day was the breakfast pancakes and eggs, two Clif bars, a couple dozen crackers, and some Fig Newtons. I had with me some salmon in a foil pouch which I had bought back in Fallon for future lunches, but I didn’t really feel like salmon and crackers today, just crackers. The weather was again very good riding weather up until just before the end of the day. It was half sunny, half cloudy, coolish turning to warm. As I approached Eureka, very tired now, I thought I could see rain falling from some clouds in the distance that appeared to be on my route. 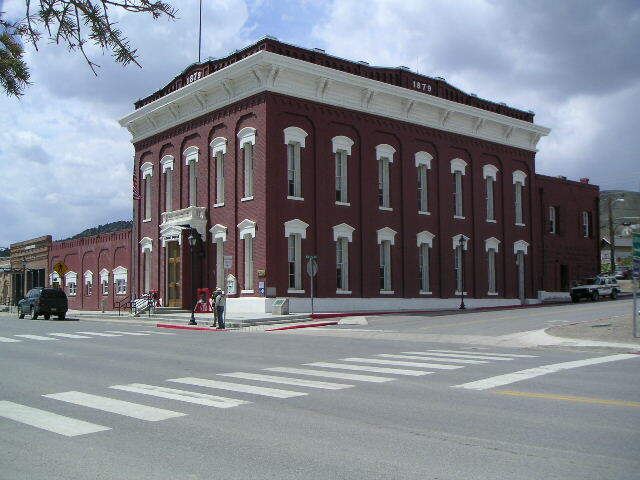 Now Eureka is a former mining center, like Austin, and it too is up a hill. So I had another end of the day climb into town while dead tired, but this time, a bit of rain was sputtering down, and it was frustrating to be going four miles an hour up a steep grade while trying to beat the serious rain into town. As it happened, the serious rain never hit. Eureka is a county seat, so the hotel situation is far better here than in Austin. I checked into a very nice room in a Best Western, walked up the street for some dinner, and again was in bed not much later than eight, with the intention of taking the next day off. And I may have to take more than that off, as the weather forecast is not good. Dead tired this morning, very definitely a good day to stay put. The local power company chose today to shut off power to the town for seven hours to do some maintenance, so there’s even less to do here than there otherwise might be. 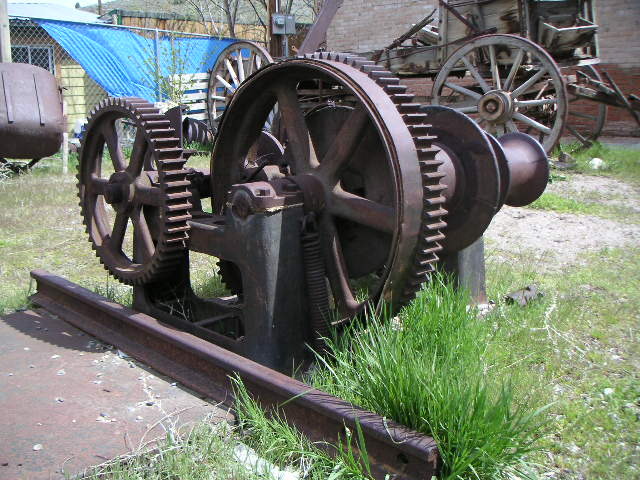 I listened to mp3’s for a while, walked around the town, which does have some interesting buildings dating from the mining boom in the 1870’s, had some lunch at the Owl Club, Eureka’s main restaurant, which had an emergency generator, then updated the journal. When the power came back on, there was some discouraging weather news on TV - from Salt Lake, video of 3/4 inch hail and a car struck by lightning on the freeway. The driver, interviewed, was completely calm; she thought at first that she’d just had a blowout. But there was a big hole blown through her windshield on the passenger side. There’s supposed to be rain all afternoon here tomorrow. I don’t really want to ride through that if I’m not completely rested; this seems like a good opportunity for another day off tomorrow. Today was an uneventful day off. The weather was not nearly as bad as predicted - it would have been an acceptable riding day. The steady rain predicted for the afternoon never showed up, although there was a brief period of rain with even a little hail late in the afternoon. I made it to the library, which had been closed most of yesterday because of the power outage, and checked my e-mail. The rest of the day was spent with half my attention on the Weather Channel, which is predicting early showers for tomorrow (Saturday), followed by partly cloudy for Sunday. So far, the Weather Channel has been predicting far worse weather than I’ve been seeing where I am at the time. But then I turn on the evening news (here it’s from Salt Lake City), and the TV stations have been rushing cameras to the sites of the worst weather - big hail here, lightning strikes there, six inches of snow somewhere else. It’s probably best not to watch the news so much. There was a fine drizzle this morning when I got up at 5:30, and it continued to about the time I left at 8:30. The temperature was in the low forties, so I wore four layers, adding a skiing long underwear top to my usual, and replacing the usual gloves with full-fingered neoprene riding gloves that I’d picked up on sale at Performance, not expecting to need them much. As it turned out, I wore them most of the day, and as I expected, my hands were swimming in them a little as they weren’t very porous. But it wasn’t as bad as it sounds, and they were warm enough. There were four passes today - today may have been my day of largest altitude gain so far. 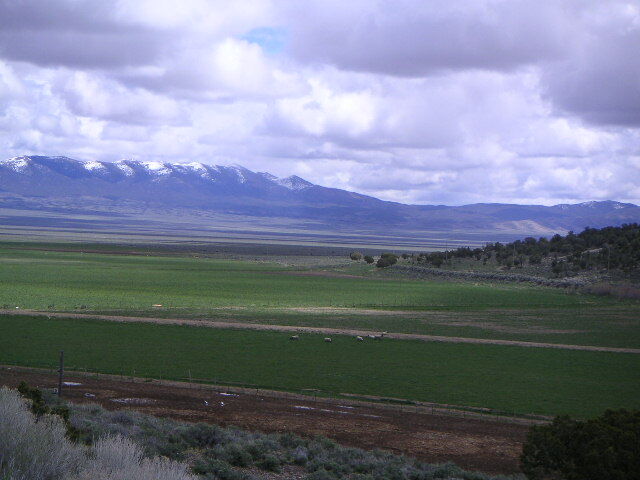 Nevada consists of large flattish bowls, twenty or forty miles wide, interspersed with ridges. Sometimes the road zigzags around the ridges, sometimes it goes over them. The climbs up to the passes are generally straight up; there’s generally no up-and-down, which is good, as losing elevation on the way up is discouraging and means extra work. The grade never seems to exceed about 6%. Riding across the flat areas is deceiving. They appear completely flat, but it’s easy to tell from the speed that it’s possible to go that usually you’re either going downhill away from the last ridge or uphill toward the next one. Often there will be an uphill slope that appears downhill because the eye mistakes the surrounding distant terrain for a true horizon. 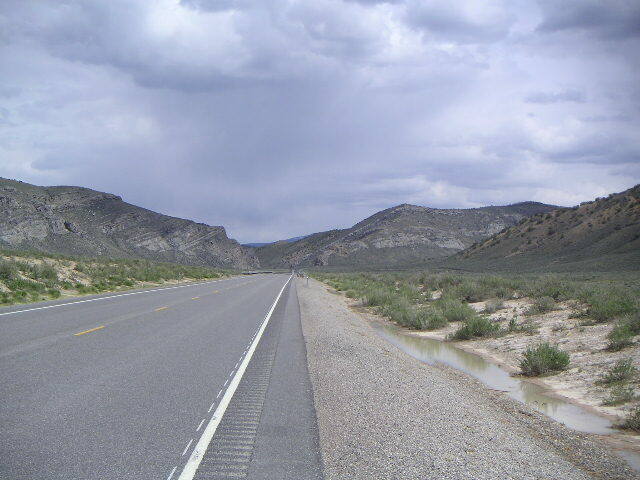 So - four passes in 78 miles - Pinto (7376′), Pancake (6521′), Little Antelope (7438′), and Robinson (7588′). Just as I reached the top of Robinson Summit, it started to hail. The hail was about 1/8″ diameter, and there was a lot of it. But way off in the distance ahead I saw a big patch of blue sky, and as I was about to be going downhill, I just kept going, getting a little wet but not too much so as the hail melted on my head, and eventually I was in the first sunlight of the day, drying off. It was completely downhill, about 18 miles downhill, from the summit to Ely - that was nice. Ely looks like it might have a few thousand people in it - by far the biggest thing since Fallon. And there are parks with trees and grass. There was a giant copper mining pit just outside of town - that may be the source of the local prosperity. I checked into another Best Western; now I’m enrolled in their multiple-stay discount program. Hmm - I wonder how much camping I’m really going to be doing the rest of the trip. Done with Nevada, at last! 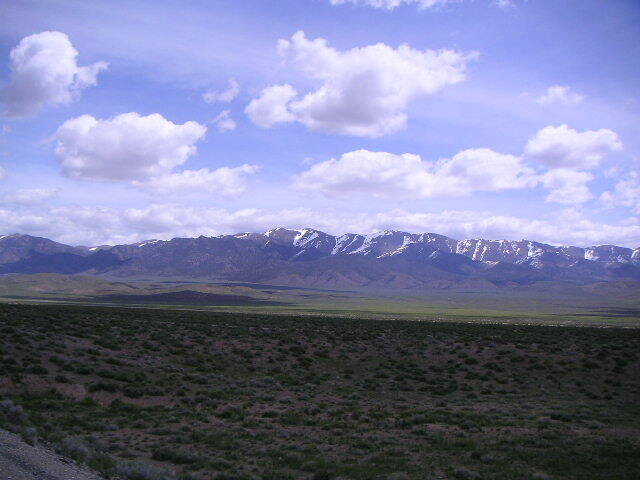 Ely is at about 6400 feet, and in front of me was the highest pass along US 50 in Nevada, Connors Pass, at 7723 feet. I am using standard highway maps for this trip, and my Nevada map is a 1982 Exxon map that I probably got free at a gas station a long time ago. It’s mildly entertaining, in some way, to try to interpret the slight squiggles on maps while looking in the distance at a collection of very tall mountain ridges. Does this squiggle imply that there’s a long climb to the pass? If the road on the map suddenly turns left, does that correspond to what appears to be a gap between two ridges? It turned out that way for Connors Pass, which was a slog uphill that I determined to take slowly and easily. So when I got to the top, I felt pretty good, launched myself downhill, and just kept on going for miles, as the downhill must have lasted 15 miles, petering out eventually in some beautiful muted-green rangeland. But eventually I was sloping up again, toward the hamlet of Sacramento, just before Sacramento Pass. Somehow the climbs up through towns are always the hardest for me. I stopped several times before I found myself in the town, which was just a small collection of dilapidated buildings, and up a slope to the right of the road, a very new house built in unpainted pine whose gate, down by the road, was a huge collection of antlers built into an arch, with a giant crowning single set of antlers at the top. 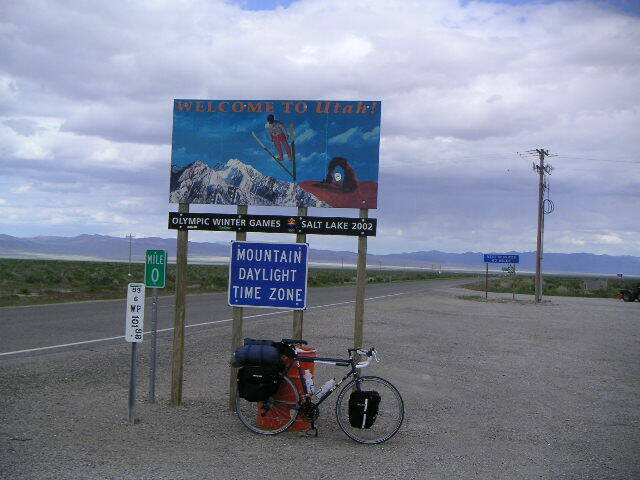 Once through the pass (7154′), there was another long, long descent to the Utah border and the Border Inn, a motel, cafe, and gas station built on the border. The motel part and half the cafe is in Utah, but the bar and the slot machines are in Nevada. I got a room there, ate some fried chicken (no vegetables, just a salad that was almost entirely iceberg lettuce), and went to bed, setting my alarm for 5:15 am mountain time. I needed to get up early; bad weather was predicted for late the next day and I had 89 miles to go.